Mix together cream, vanilla and cinnamon, and leave to infuse. Make caramel with trehalose, sugar and glucose syrup. Deglaze with warm cream infusion and emulsify. Leave to cool to 70°C, add fruit purees, butter and cocoa butter, and emulsify with hand blender. When ganache reaches proper temperature, pipe into mould. Mix together cream and zest of 1 yuzu, and leave to infuse. Heat together with sorbitol and glucose syrup. Add chocolate, gianduja and roasted hazelnut puree, and emulsify. Add hazelnut liqueur and emulsify with hand blender. Mix together, pre-crystallise and mould into shell. Pre-crystallise cocoa butter colouring and spray into mould. Spray gold powder into mould. 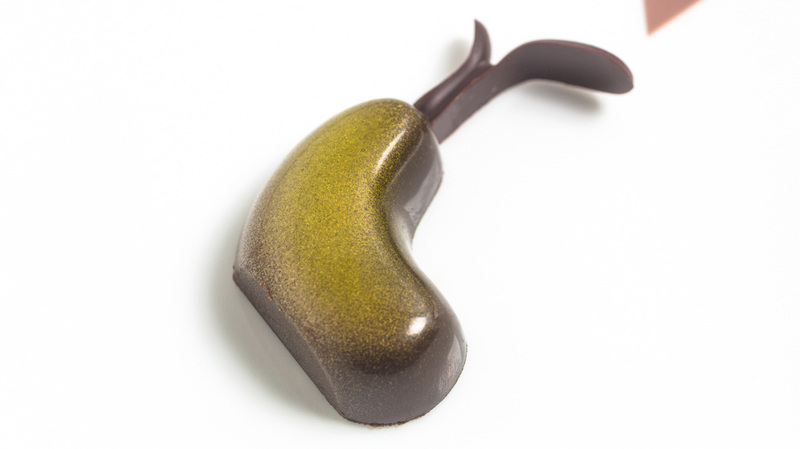 Fill moulded shell with exotic yuzu caramel and ganache noisette. Leave to crystallise and close with pre-crystallised chocolate.